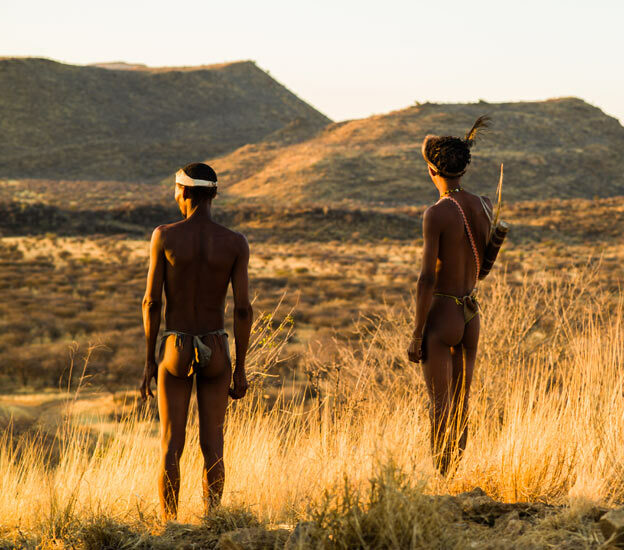 Isaac, one of our San Bushman guides enjoys the sunset in the bush. There is no lingering dusk at these latitudes; one minute it’s day and the next it’s night. 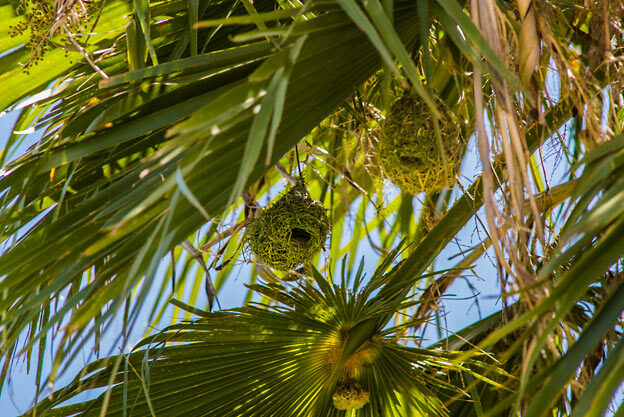 A marvel of nature; Southern masked weaver bird nests clinging on high up in a palm. The male, with his striking yellow plumage fastidiously weaves one of his nests from grass. It’s fascinating to see one of these creations close up but what is perhaps even more so is the fact that the male will often carefully construct more than twenty of these nests every season, before a female carries out her inspections, chooses her favourite, and completes it by lining the inside with feathers. Throughout the trip we kept a thorough record of all the birds, mammals and reptiles that we had the pleasure of observing. 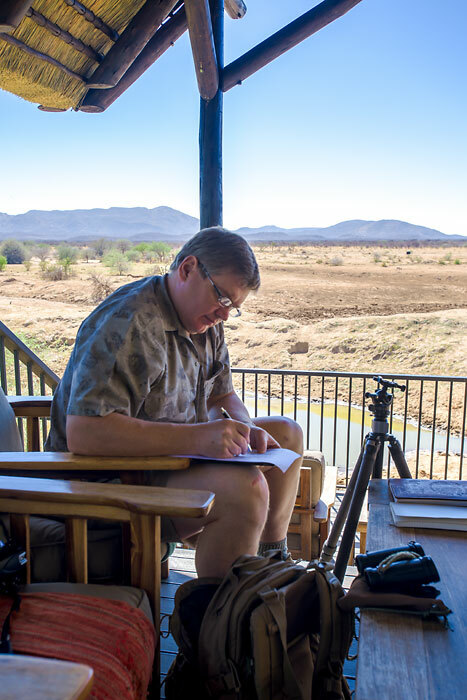 Here, after a day in the bush, Ray is making notes on his personal observations. 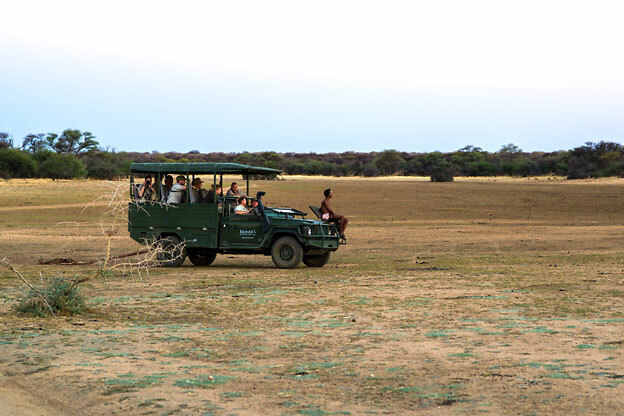 As you can see, a high point in the landscape not only provides stunning views but also a great vantage point for spotting animals in the thick bush. I think it is times like these, when the sheer enormity of the land displays itself and becomes interpretable, that you fully appreciate where you are. This incredible landscape never gets tiring; even for those who spend their entire lives amongst it. 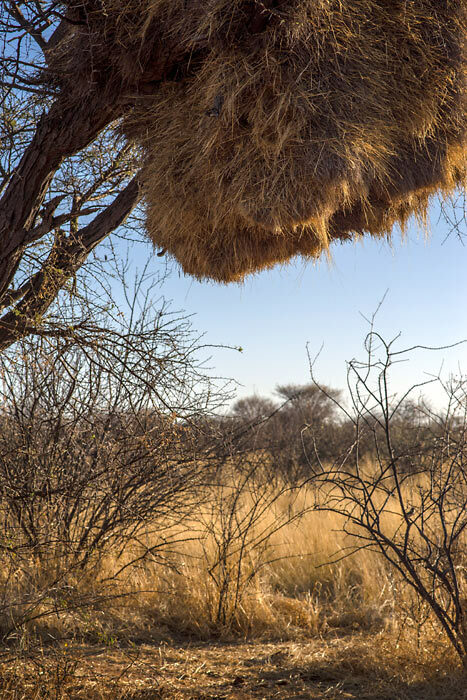 The carefully crafted home of the sociable weaver. This baffling scene looks rather like someone has dumped a haystack in a tree. In fact, it is the carefully crafted home of the sociable weaver. These fascinating little birds are found in large groups, sometimes several hundred strong and together they live in one big ‘apartment block’ like this. Carefully maintained by the birds, some nests are more than a century old. 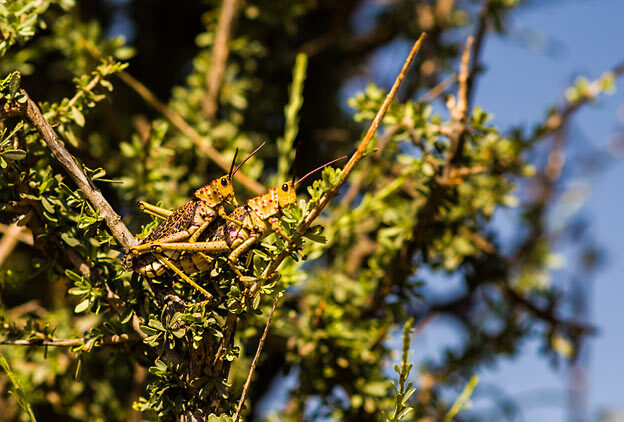 Can you spot the venomous boomslang (tree snake) searching for a meal? Vehicles like this one make close viewing of many species possible while minimising disturbance. One of our bushman guides, Gwe, sits poised on the front of the vehicle where he scans the dust for the relevant tracks and signs amongst all the others as we drive. Tucked away up in the surrounding hills, rock engravings, some of them thousands of years old, can be found. 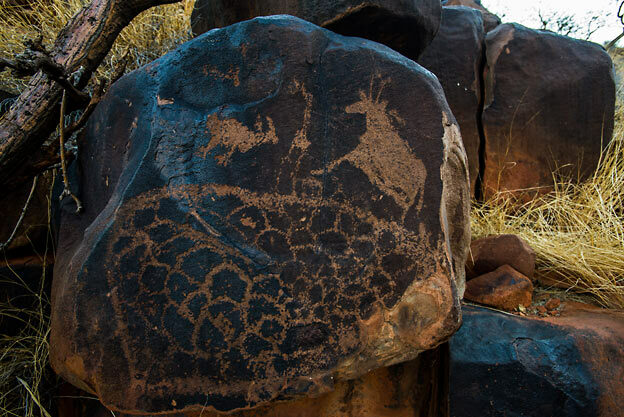 On this rock there are several etchings; amongst them an eland and a giraffe, but perhaps the most interesting is the series of scale like depictions on the lower portion of the rock which represents a pangolin. This secretive and rarely observed mammal is one that our group were, on one occasion, fortunate enough to encounter in the flesh too. Uncluttered by our western garb, Isaac’s quiver contains all he needs to provide for himself when out on the land. 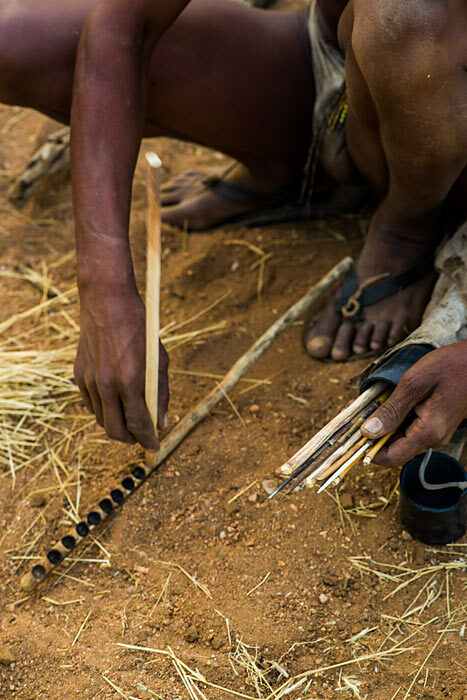 What on first inspection may just look like a container full of sticks, is actually a sophisticated array of life supporting implements, the designs of which are a result of thousands of years of human ingenuity; a specialist tool kit appropriate in a specific environment. So deeply imbedded is the value of this equipment that he goes nowhere without it elegantly slung over his shoulder. 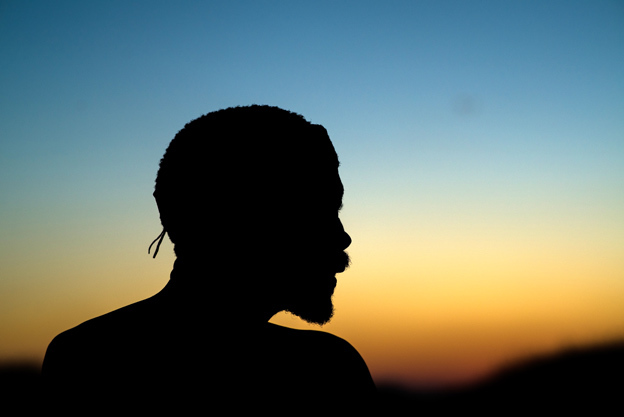 A bushman’s silhouette is instantly recognisable. 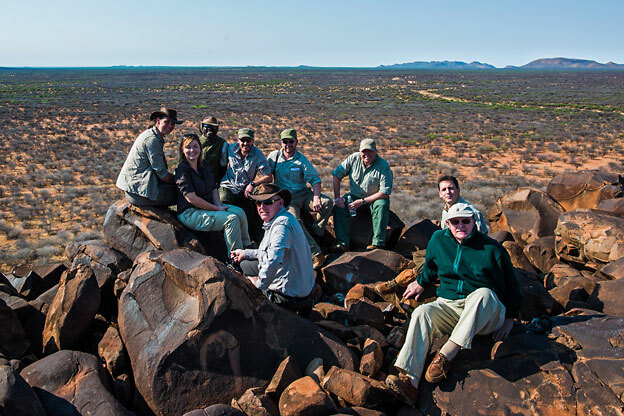 We would like to thank all our guests that have accompanied us on our African expeditions both this year and in the past, and we look forward to welcoming others on future expeditions. 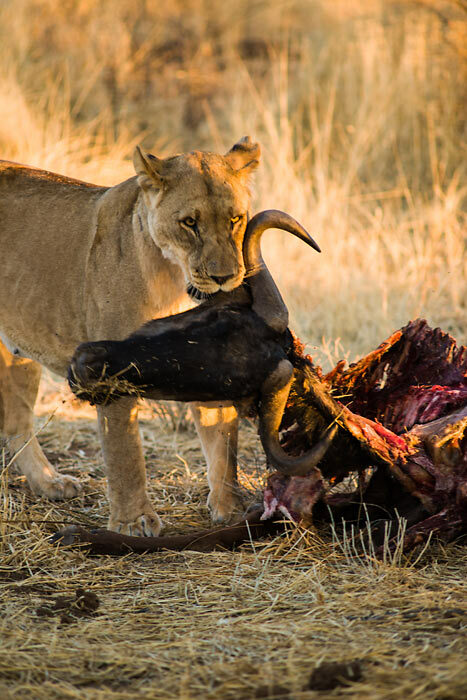 While we currently do not have an African expedition available to book, we invite you to browse both our expeditions and tracking courses.